Have you ever refashioned something and think “Is this cute? Do I like this? 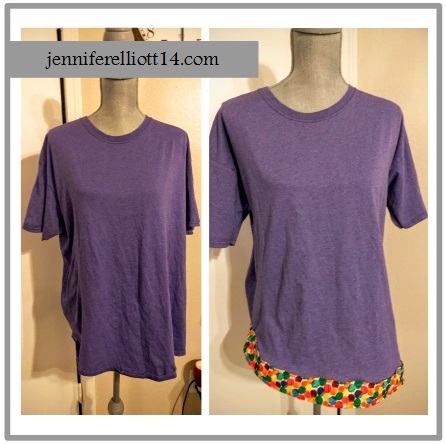 Can I make this cuter?” I took a nice light purple T-shirt and made an asymmetrical cut. I absolutely fell in the love with a bright multi-color table runner found at a consignment store. 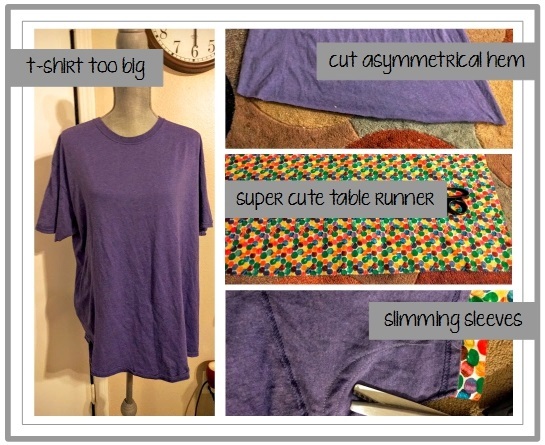 At first, I thought about using the table runner in a future quillow, but when I accidentally laid it next to a couple of T-shirts, the table runner perfectly matched several different shirts! Awesome! I cut a 4-inch wide strip from the table runner and sewed it lengthwise, creating a long tube. After turning the tube to the right side, I simply sewed the tube to the shirt’s hem. Because the T-shirt is knit and won’t fray, I didn’t bother making a new hem and covered the raw edge with the tube. Before trying on the shirt, I slimmed down the sleeves. I love the new look of the shirt — it’s simple but super cute. I love the pop of color on the hem, and the sleeves are perfectly slim. But a few questions kind of nagged me. “Is this kind of plain?” “Does the shirt need something more?” If I added matching bias to the sleeves would that be too much? Way too cutesy? What about a matching pan collar? Too much? Should I do something the collar? Argh! So many questions, and no answers! I’ll wear the shirt a couple of times and hope inspiration hits me. If you have any ideas or suggestions, please share in the comment section. Thanks! Honestly, I like the shirt just the way it is. Simple is best. That’s my opinion but I’m not a fashion expert either. Hmmmmm. I kind of like that idea drawing a bit of attention to the back of the shirt. Thanks so much! That table runner is bright and vibrant and adds POP to the shirt. I was thinking of that bright colour at the shoulders – cap sleeves instead of or over top the purple ones. You could make cap sleeves and tack them on until you see if they speak to you. Or a strip between the shoulders and sleeves. Then again (or as well?) maybe along the bottom edge of the sleeves. What about a V in the back; the point could go up or down. Whatever you decide, let me know OK? Thank you so much for all your great ideas! I will definitely let you know what will happen next.